There are many types of cataracts, or rather types of changes seen in the lens, and these may present in any combination. Each can occur with normal aging or secondary to another process. Some cataracts are present at birth. The type of cataract is not necessarily important, but how it affects vision for the patient, as all are dealt with in about the same way. Cataracts will normally develop with time, inevitably, in everyone. There are some factors which may cause them to progress faster, such as diabetes, uveitis, infections, trauma, or long-term use of steroid eye drops or pills. There are some cataracts that characteristically develop from certain heritable and systemic diseases, but these are uncommon. Unfortunately cataracts are inevitable; however there are some methods which may be of benefit to slowing their development. Protection from ultraviolet light with sunglasses may help, as may anti-oxidants or use of an aspirin daily. Once cataracts that are visually significant to the patient forms, they are not reversible. The initial symptoms of cataract may only be a change in glass prescription; however later even new glasses will not correct for them. Patients often complain of blurry vision, requesting a check for new glasses. Most patients begin to develop symptoms and have no idea these are due to cataract formation. Common symptoms include haloes and glare with bright lights, especially while driving at night, or difficulty reading or seeing in dim light, or seeing the television clearly. Occasionally cataracts can cause double vision, which is very bothersome. Cataracts can become so severe as to decrease vision to only the ability to perceive light. 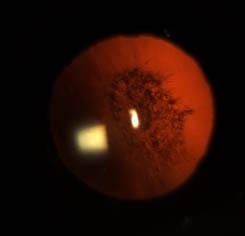 Cataracts are seen on examination at the slit lamp biomicroscope by the ophthalmologist. A careful history is reviewed to evaluate for potential causes, if any. Vision is checked; (it may worsen with challenge by bright light while reading the eye chart). Potential vision after cataract removal may be checked by special instruments. The quality of cataract is documented, which is important to the ophthalmologist to help determine the best approach to surgery. What is the prognosis for cataracts? Generally vision is well preserved behind the formed cataract, so that after removal of the cataract, the patient will be able to see quite clearly, potentially without the need for glasses for most of what they do. Cataract surgery is the safest and most effective of all surgeries, and the most common surgery done in the U.S. today. There are, however, risks to any surgery, and though they are rare, cataract surgery is not without these. Today 96% of patients who have cataract surgery have an excellent outcome, meaning 4% will have an outcome that is less than perfect. Unfortunately, cataract surgery can not improve vision lost due to other eye problems like glaucoma, diabetes, or macular degeneration. There are usually different options available to patients for the types of lenses that are placed inside the eye during cataract surgery, which one may decide upon prior to surgery. Patients who choose the basic lens will usually see clearly after surgery in the distance, perhaps needing some fine tuning with glasses, definitely needing glasses to see up close. There are other lenses, so called “premium” lenses (insurance does not cover these) which offer further benefits such as great reduction in astigmatism or the ability to see both in the distance and up close well, with minimal use of glasses if they are needed at all. About 85% of people who ultimately choose a premium lens are extremely satisfied with the outcome. It should be noted that not every patient is a candidate for these lenses. As technology changes, newer and more sophisticated methods of cataract surgery will be developed, though outcomes have been excellent for some time. The mere presence of a cataract is not an indication for surgery. There are patients with cataracts who actually see quite well and are happy with their vision. Others are bothered by even small cataracts. Surgery is considered when the patient is experiencing vision changes that affect activities in daily life – changes that are attributed to cataract, that are not treatable by more conservative therapy like glasses. Cataracts are also removed for medically necessary reasons, such as the need for the ophthalmologist to see inside the eye more clearly to treat vision threatening diseases of the retina. Only in rare instances is cataract surgery an emergency, so the procedure can usually be scheduled at the patient’s convenience. Cataract surgery is usually performed as an outpatient procedure. The surgery itself is typically 15 to 30 minutes long and recovery is quick and normally without any discomfort, requiring only the use of drops for a few weeks after surgery. Small incisions are made by the surgeon and, with very sophisticated machinery, the cataract is removed and a new lens is placed inside the eye. There are some restrictions for a few weeks after surgery, which mostly involve limiting strenuous physical activity or anything else that may result in increasing pressure in the eye or tension in or around the eye; bending over, sleeping on the side of the surgery, or rubbing. To print this article, click here.